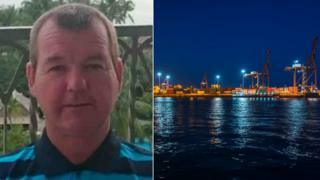 An oil worker from Dundee has died after falling into a harbour in the Canary Islands. Colin Gillespie, 53, was a member of the crew of the drilling vessel Stena Icemax. He was pulled from the water in the harbour at Las Palmas early on Sunday but efforts to revive him failed. Police in Gran Canaria have said they believed the death was an accident, although they are awaiting the results of a post-mortem examination. Mr Gillespie was a former pupil of Menzieshill High School in Dundee and is thought to have worked as a crane operator for Stena for the past 17 years. The Stena Icemax has recently been carrying out exploration work off the Irish coast and had been in Puerto de la Luz, a port close to the city of Las Palmas, for maintenance work. Stena Drilling, which is based in Aberdeen, has launched an investigation into the incident. In a statement the company said: "Stena Drilling Limited confirm a tragic accident has occurred involving one of our crewmembers whilst returning from shore leave to the vessel Stena Icemax in Las Palmas, Gran Canaria, Spain. "The crane operator was returning to the ship on Saturday night, when it appears that he fell from the quayside into the water. He was recovered from the water and emergency medical response procedures were initiated, but sadly he did not recover. "Relevant Spanish authorities have been notified, with support services being co-ordinated through the shore based incident response team at Stena Drilling's head office. "An investigation is underway into this tragic accident and our deepest sympathy goes to family members and next of kin."